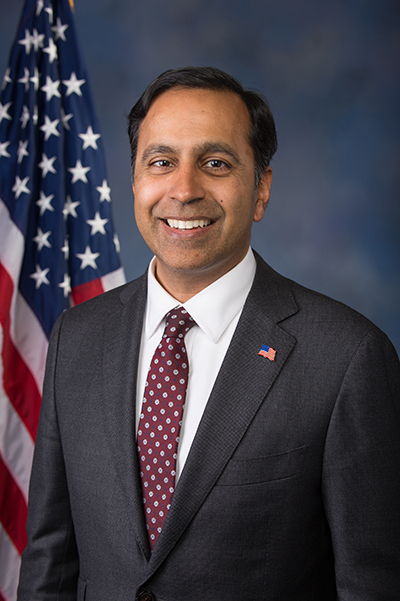 Congressman Raja Krishnamoorthi was elected in November 2016 to represent the 8th District of Illinois, which includes the west and northwest suburbs of Chicago. Raja serves on the Oversight Committee, for which he is also the Chairman of the Subcommittee on Economic and Consumer Policy, as well as on the House Intelligence Committee. In addition to this committee work, Raja was selected as an Assistant Whip and serves on the Steering and Policy Committee. Raja’s policy platform focuses on growing and strengthening the middle class by supporting small businesses, rebuilding our infrastructure, and protecting Social Security and Medicare. Raja knows our economy works best when it works for all of us, and that’s why he’s fighting to make college more affordable, expand access to paid sick and parental leave, and guarantee equal pay for equal work.